So as a vegetarian, I loved Spinach and Feta Pie, or Spanakopita. But as I love cows more than I do cheese, I thought it was only fair I make my own Vegan Spanakopita. It has now become a firm favourite at Urban Zen Yoga Cafe in Swansea, where one pie generally sells out within a couple of hours. So I thought I’d share spread the love and share the recipe. It’s the perfect thing to enjoy on a warm summers day with some nice potatoes and salad. 1. Wilt the spinach in a pan in a little water and then set aside. Drain off excess water. 2. In a large mixing bowl, combine all the other ingredients together, apart from the filo pastry. Mix it all in well and add in the spinach. 3. Brush a large, deep oven dish with olive oil. Layer 3-4 sheets of filo pastry all around the dish, across the bottom and up over the sides, with enough pastry to fold over a few inches into the middle. You need to brush olive oil in between each sheet as you layer it. 4. Spoon the tofu mix onto the pasty and smooth down with a spatula until evenly and firmly distributed. Now place some filo layers over the top, brushing with oil and you go, so the pie becomes enclosed. Smooth off the top with more olive oil. 6. Bake in a pre-heated oven at 180C/Gas Mark 6, for 20 minutes, until the top is golden. 7. Serve with additional toasted pinenuts sprinkled across the top with a lovely salad and potatoes. Iolo and I have been out all day, cycling around in the cold. On arriving home, all we could think of was hot chocolate and cake to warm us up. 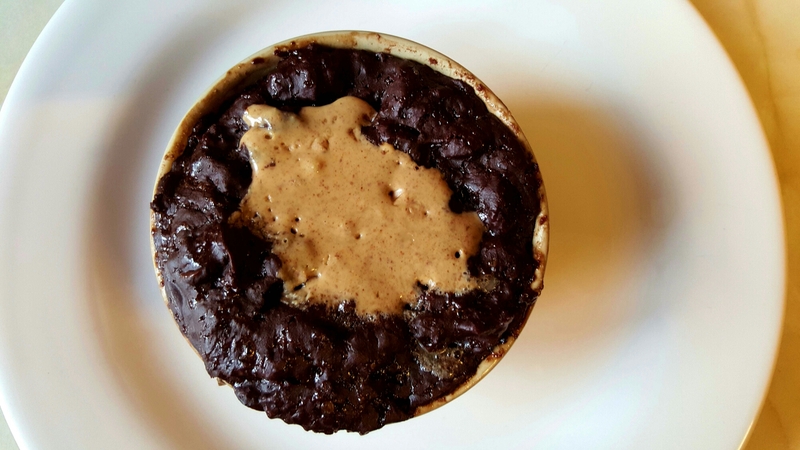 So I remembered someone had told me this week about microwavable vegan mug cakes when we were talking about quick desserts. I must confess I’ve never made one and never cook in a microwave, but I thought we’d give it a go. 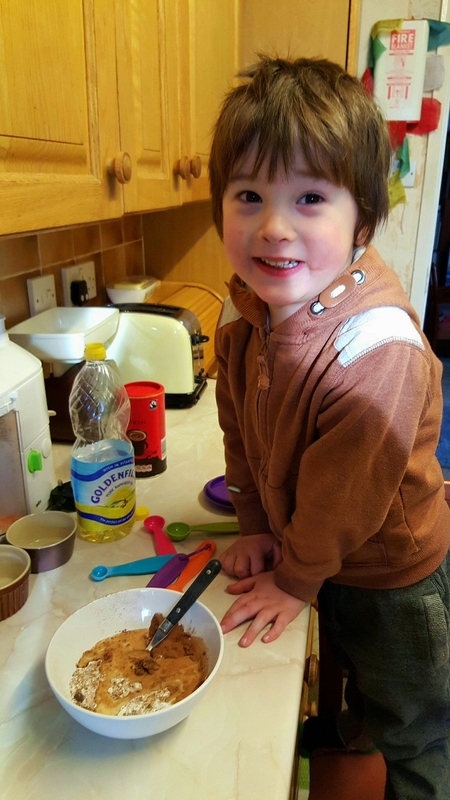 Iolo is now three and loves helping in the kitchen! So we gave it a go and it was a great, tasty success. We loosely followed a recipe by Not Quite Nigella and here is my adaptation. 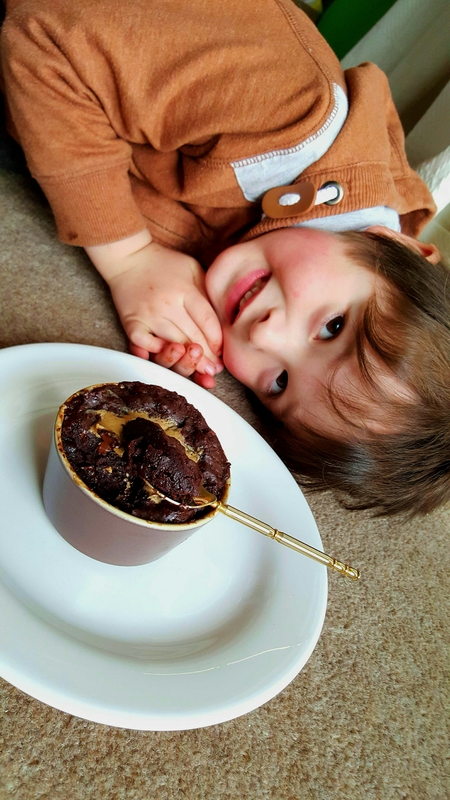 It produces a moist and rich chocolate cake/hot pudding that really was rather nice! 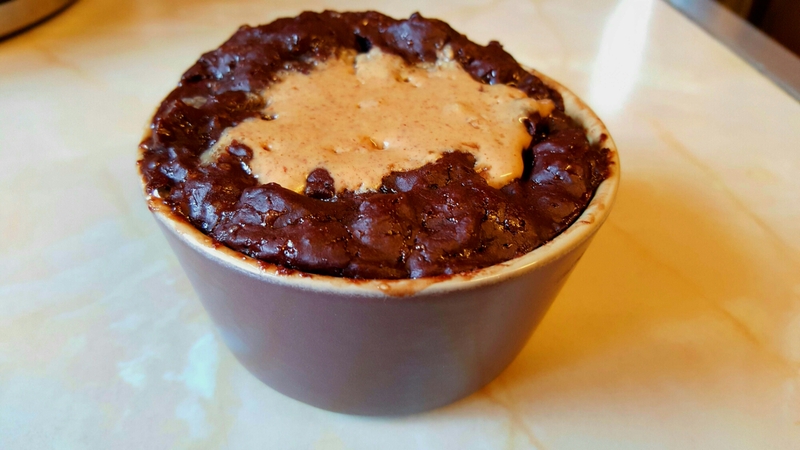 You can make it in a cup or ramekin like I did. 1. 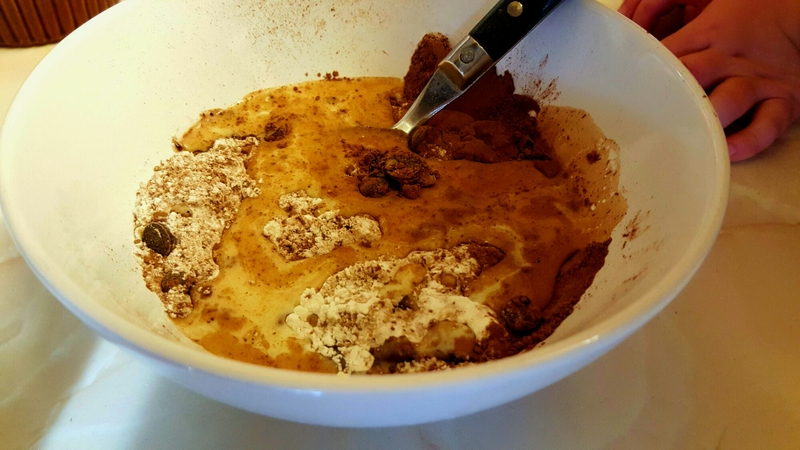 Combine all dry ingredients into a small bowl and mix. Stir in and combine oil and milk. 2. Spoon into a cup or pot. 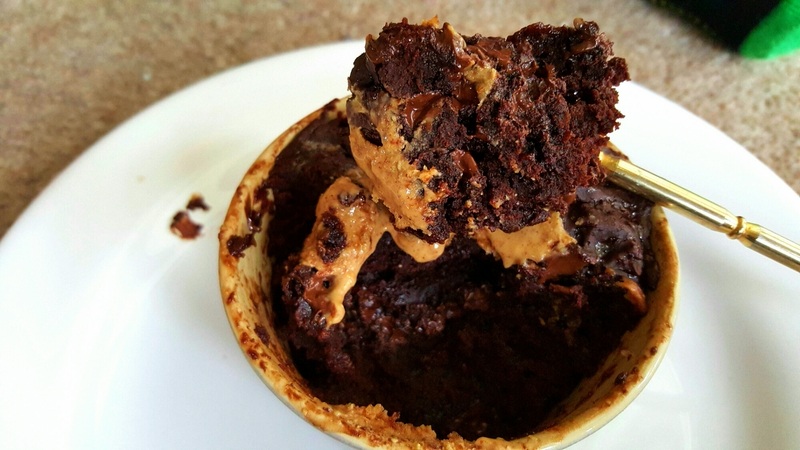 Make a hole in the top and add the peanut butter. 3. Microwave on half power for one minute. Check to see if the cake is cooked, it should fell set on the top. Return to the microwave for another 30 seconds on half power if needed. 4. Wait to cool a bit before enjoying! Additions: You could add some berries on top or mixed nuts to add more flavour and texture. The problem, sometimes, with being someone who just loves cooking, is that you can have too much great food! Being a vegan chef means I certainly never, ever, miss out on anything. You name it, I will cook and eat it (if it comes from plants, obviously!). So this December I’ve been doing just that, at work and at home. Squash and Spinach Filo pies, soups, salads, sweet potato chips, mayonnaise, vegan cream cheese, roasted veg, stuffing, sourdough spread with avocado and Marmite, dahls, chapatis and rice, raw chocolate, raw cake, crumbles, puddings, mince pies, chocolate, more chocolate, udon noodles, edamame, tempura vegetables, ice cream, deluxe chestnut, shallot and mushroom tart, roast potatoes… the list just goes on. But somewhere, we have to create a balance. Even when you are eating home cooked, delicious vegan food, sometimes our bodies just need a break. Digesting rich foods takes power, it takes energy. After completing a four day yogic fast in the summer, I saw how you can actually increase your energy by fasting and then temporarily eating less and more importantly, eating a bit differently. I am a realist however and not a food saint. I’m going to share a nutrient packed, colorful, fresh and mostly raw dish and juice to give your body a little rest and a boost. I’m not saying I’m going to be jumping on the New Year detox bandwagon tomorrow and I’m not suggesting you do either. I’m hoping to embrace a more rounded and sustainable approach. 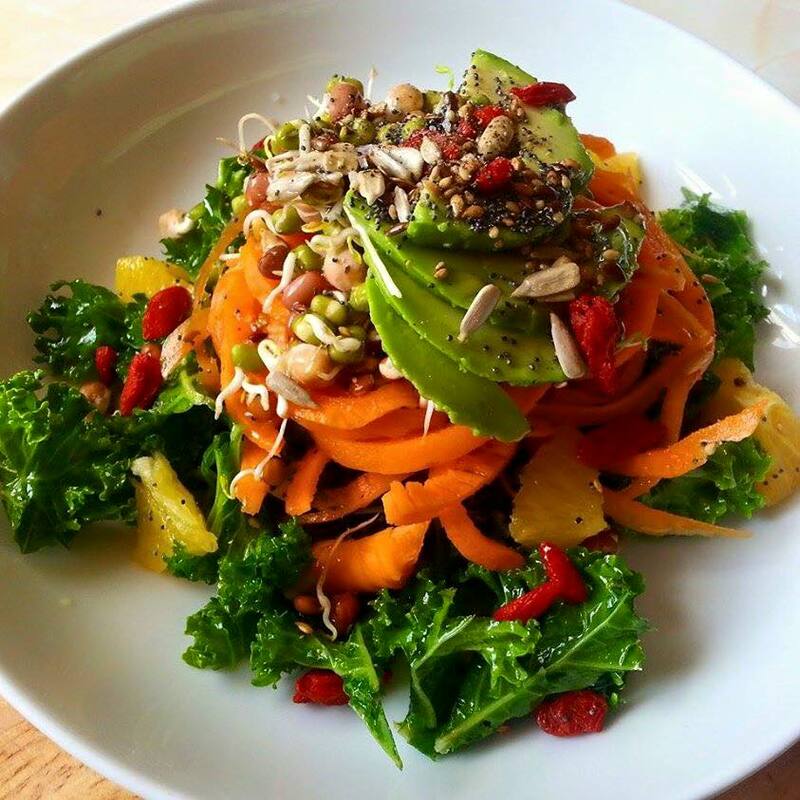 By incorporating more raw fruit and vegetable based dishes and drinks into your diet in general you can give yourself a gentle daily boost that won’t leave you beaten and reaching for that coffee and cake because you’ve simply gone all-out too intensively after a season of indulgence. Today I started the day with a cup of hot water and a slice of lemon, to get the digestive system moving. I followed this with a cup of matcha green tea, to give me an easy mood and energy lift. This was followed by two pieces of wholemeal toast with almond butter and banana. Mid morning I had my Supergreens Juice. Nutrient packed, this tangy and wholesome juice will really get you off to a great start! Pass the following ingredients through your juicer, and enjoy! Topped up with 1/4 cup of water or more to reach desired consistency if the smoothie is too thick. You can add the apple and celery, but they give a lumpy consistency when blended. For lunch I put together a salad bowl of Raw Squash Spaghetti, Toasted Pumpkin Seeds, Hummus, Edamame, Peppers, Lamb’s Lettuce and Raw Vegetable Cous Cous. Raw Vegetable Cous Cous is the latest thing! You can ever buy it in Tesco. 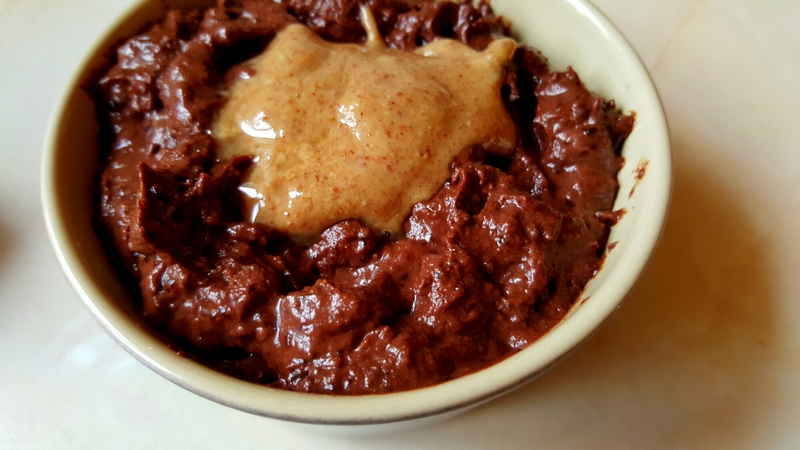 It’s great for a raw meal and especially handy for wheat-free diners. Dressed with 2 tbsp of apple cider vinegar mixed with 2 tbsp olive oil, cracked sea salt and black pepper. Add in different veg to see how it turns out! for example cauliflower or peppers. Here’s another recipe for an amazing looking Raw Veggie Medley Cous Cous to give you some more ideas. So why not treat yourself and your body to some fresh, raw and lively foods this January, if not everyday, whenever you feel like you need a lift and your body needs some TLC. Now the pots and pans have found their proper homes in the new kitchen at Urban Zen Yoga Wholefood Cafe in Swansea, I’ve had time to make some specials. We have served up a couple of delicious Squash, Spinach and Toasted Pinenut Filo Pies in the last couple of weeks. This week, manager Amina, came across this delightful seasonal tart recipe from Jamie Oliver. While I can’t take credit for this recipe, I just had to share it, since it has been crowned such a triumph in the lead up to Christmas. It is great to see popular chefs such as Jamie embracing more and more vegan food. Here is the link to the recipe. All I did to make it simple was use ready made Jus Roll Shortcrust Pastry instead of making my own. I also topped it with fresh rhyme, not parsley. It’s been a month since Swansea’s first vegan cafe and yoga studio opened its doors. Urban Zen, on Little Gam Street, has been causing some serious ripples in the Swansea food scene! What no cow’s milk? What no bacon sandwiches? That’s right. And I’m very proud to be the head cook at this revolutionary new business in the city centre. Since August I have been worked closely with the owner, Emily Cole, to develop a unique and innovative wholefood menu that aims to fill people with nothing but delicious and extremely healthy food. We’re had a fantastic first month, welcoming hundreds of people through the doors to what is only Wales’ second 100% vegan eatery. We offer an extensive breakfast and lunch menu, alongside cakes and a large selection of juices, smoothies, teas and coffees. You can read more by visiting www.urbanzenyogacafe.com or finding us on Facebook, where we are very proud of receiving no less than forty five 5* reviews already! The cafe at Urban Zen was created out of a passion for nourishing people with delicious whole foods. “Our aim was to create an exciting menu and environment that supports health and sustainability for both our community and the planet. Our plant based menu is prepared with love and changes regularly to reflect the seasons, we source locally and organic where possible. We promise to never serve you anything from the “dirty dozen” (the Environmental Working Group’s list of foods with the highest levels of chemicals and pesticides present) unless it’s organic, regardless of the cost or difficulty in sourcing. Here are some highlights in pictures! The first image is of owner, Emily Cole, enjoying the first Full Vegan Breakfast on opening day. After three years of running Lots of Nice Things and being involved in many different vegan food projects and events and after much hard work, I am delighted to tell you all that I am going to be starting work as Head Cook in a new vegan cafe and yoga studio in Swansea. Urban Zen Yoga Studio & Cafe will offer a wide variety of Yoga classes and health treatments alongside its wholefood cafe in the heart of Swansea city centre and I am currently working hard producing its first menu! My heart tells me it is time to bring Lots of Nice Things to a close. I’d like to thank you all for your interest and support over the last few years and I hope you’ll continue to follow my work and recipes through Urban Zen Cafe. Our website, which currently under construction, will feature a blog where you’ll be able to see exactly what we’ve been up to. You can also follow on Facebook. If you happen to be in Wales, please come down and say hello.